thnx for that link, Knut - i enjoyed reading his comments and reviews of the Hollies' albums. Finally someone recognizes the greatness of The Hollies' albums (especially the ones released during the psychedelic era) because mostly they are ignored (even by The Hollies themselves). They should play more Evolution or Butterfly tracks these days. It’s interesting how they make their own and very personal versions of Hollies songs without imitating exactly the original Hollies sound. Here is a review of Re-Evolution. And here is a nice version of Butterfly, by the Swedish duo Us and Them. Record Collector reviews the tribute album in the March 2013 issue (412). Writing very positive about the Hollies, Terry Staunton is more critical to the new versions. "...what comes across more often than not is the sense of adventure the songs contained in the first place." And in conclusion: "A tribute album with a difference, and an acknowledgement of a great group's underappreciated inventiveness." 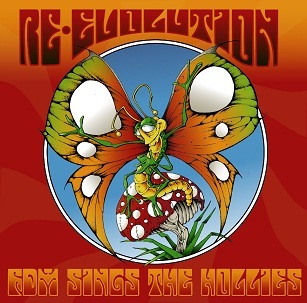 I´m much more positive to the tribute album Re-Evolution from Fruits de Mer Records than Record Collector. If you want a trip back to the 60´s and the psychedelic era this is it! If you´re a Nash-fan here´s some really good interpretations of the songs he influenced most. It´s amazing that you only can get this album on vinyl (red). But it´s gatefolded with a great artistic work. There´s also included an EP (on blue vinyl). This record is something extra in many senses! The record seems to be sold out already but I managed to get a copy via Discogs. This is going to be collectible as only 800 copies are said to be made.